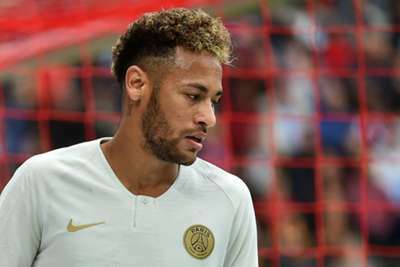 Neymar denied being angry at being substituted during Paris Saint-Germain's win at Rennes and explained his interaction with a young fan as he made his way from the field. The Brazil superstar set up Thomas Meunier to put PSG in front after an Angel Di Maria thunderbolt got Thomas Tuchel's side back on level terms in Sunday's 3-1 Ligue 1 win. Neymar was substituted in the 91st minute at Roazhon Park and a tearful young supporter entered the pitch to meet his hero, receiving the PSG attacker's shirt in return. "They even thought I asked to wait a little, but no," Neymar told reporters of the substitution. "I went to apologise for the wrong pass I gave to Thomas [Meunier]. "Of course, no player likes to leave the game, but now this isn't the case for me to be angry at having left the pitch today, it's even good for me to recover for the next game. "I am happy with the affection I receive when playing away, even more when it's from a kid, it's more natural, it's something very pure, so whenever I can I will do everything to return the affection I receive." Neymar has played various roles for PSG this season, Tuchel seeming to prefer his star man in the number 10 position rather than on the left wing. And Neymar is happy to play wherever his coach asks, acknowledging the depth of attacking talent available to PSG gives Tuchel a lot of options. "In the middle there are even more players than on the flanks. It was our coach's strategy," Neymar said. "And he thinks I have the quality to play in the middle, and he put me there and we turned the game around. "I think it's because of the players we have in our team. Di Maria, Kylian [Mbappe] and other players that play on the wings. And he sees that I have the quality to play in the middle. I've played like that in Santos, in Barcelona, so for me, it's not a problem at all. "The relationship [with Tuchel] is good. He is a young coach who has his way of playing, of training, and we really like how he trains and talks to the players, and I hope that with his work we can have a great season."